Mornings and I don’t get along. They are far too early, and my brain never makes it up until lunch time… so cooking is a challenge. 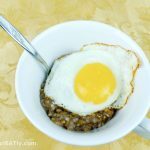 This buckwheat porridge with fried egg takes less than 5 minutes to make, and keeps me full and happy until a much more reasonable time of day. This dish is easy to portion control, measure the kasha either by weight or by volume before adding the rest of the ingredients. The volume of the porridge will triple when you cook it. It doesn’t look like much food at first, but it will keep you full. This dish is also high in fiber and protein, so it will keep you feeling full for hours, even though it isn’t high in calories. In a microwave safe bowl (or mug) add the buckwheat, water, salt and pepper. Microwave for three minutes, or until the buckwheat is tender and the water has been fully absorbed. Alternatively, you can make the kasha in a pot on the stove. Just add all the ingredients, and simmer until all the water has been absorbed. While your kasha is heating, heat a frying pan over medium heat. Add the butter and spread it around the pan. Once the butter is melted, crack the egg over the pan. Cook until the whites are set, but the yolk is still runny. Slide the egg onto the porridge. To eat, mix the fried egg into the porridge for a creamy, savory breakfast.